Demonstration apparatus for the properties of the crystal lattice of ferromagnetic materials, particularly Weiss domains, Barkhausen jumps, saturation, hysteresis and Curie temperature. 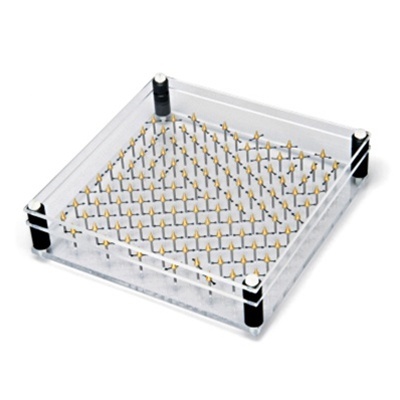 117 freely moving magnetic needles are supported in a hexagonal arrangement between two connected transparent acrylic plates. For projection on the overhead projector. U8495185 Pair of Flat Coils for generating magnetic field, sold separately.